I was given this faulty board ages ago as a spare System 16 base board when I was trying to work out if my Golden Axe board had suicided. The fault was the sound effects were all messed up and some of the graphics were flickery. Sorry no photo as it was next to impossible to get a photo that showed the problem. 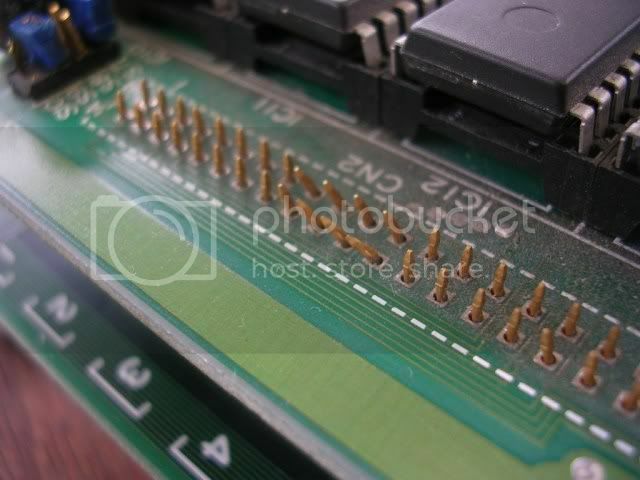 Anyway - the gfx issue was quite simple, the romtop had clearly been squashed at some stage and some of the pins protruding through from the edge connector had been bent, a number were touching. Straightened them out (badly by the look of the photo, but at least no longer trouching) and the gfx issues vanished. The sound effects were more of a problem, could not find any issues at all, everything looked healthy. The music was fine, and some samples were good too, but some were just wrong, the most annoying was that the "bullet hit" sound was a loud clanging noise that went on for about ten seconds after each hit. After a while I wondered if the jumpers on the rom board were correct, and/or all present. 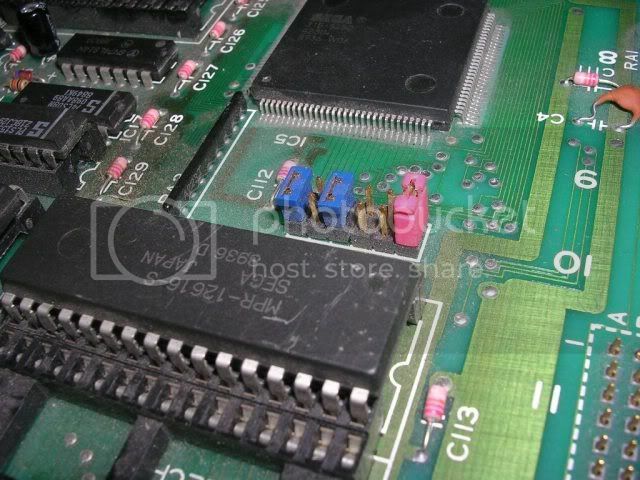 Really struggled to find a decent image of this board online, plenty for other System16B games but not much for this one, in the end I did find a low res image that showed a hint of a blue pixel on one of the jumper blocks, my board had no jumper there, so I fitted one, problem fixed! Could only find a single spare jumper - pink it was. It makes sense, I assume these jumpers link up the address bus depending on what EPROMs are on board, many games use the same PCB so the board has to take many different eprom sizes. As the sounds were ok (just the wrong sound) I guess the data bus was all ok, wrong addressing (missing address line) would mean the wrong sound data being called from the ROM. Page created in 0.096 seconds with 21 queries.